In 2018, the Centers for Disease Control and Prevention (CDC) found that the prevalence of autism spectrum disorder (ASD) in the United States is approximately 1 in 59 children. Impairment in communication abilities is one common presentation in children with autism, but the range of communication impairment varies a great deal. 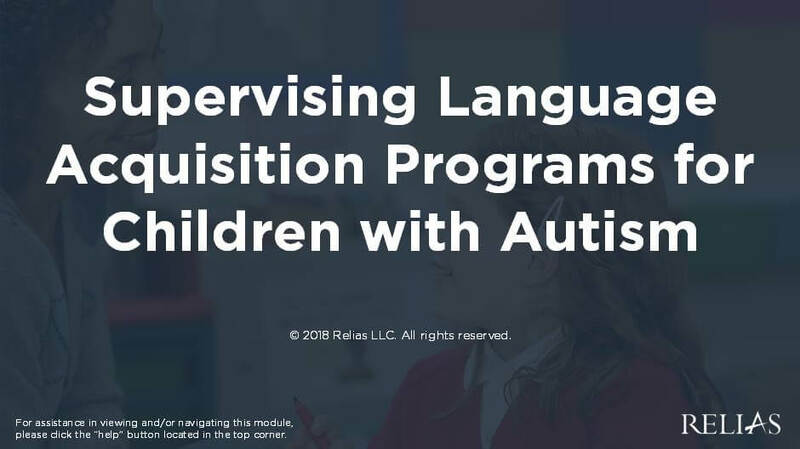 This course will address how to establish a framework for setting up and supervising robust language acquisition programs for early language learners in schools. Identify specific targets for training personnel to implement language acquisition programs. Utilize supervision techniques to ensure treatment fidelity. Utilize intervention data as a means for ensuring supervision effectiveness. Rosemarie Griffin, MA, CCC/SLP BCBA, is an ASHA certified Speech-Language Pathologist and a Board Certified Behavior Analyst. She divides her time between a public school and a private school for students with autism in Ohio. She's presented at the national, state, and local level about systematic and collaborative language instruction for students with autism. Mrs. Griffin is also an adjunct professor here in Ohio, teaching a graduate level course about behavior analysis and ethics. In addition to these interests, she is the creator of the action builder cards. This nationally distributed therapy product provides professionals with a means of delivering evidenced based language therapy. They can be purchased at www.differentroadstolearning.com. Her professional mission is to help all students expand their communication step by step. She can be reached at www.abaspeech.org, Facebook @abaspeech, Instagram @abaspeechbyrose. The target audience for this course is: Behavioral Analyst; entry level Speech and Language Pathologists; in the following settings: Intellectual Developmental Disabilities.